At three years old, Emma Grace never slows down, playing with siblings and friends and dancing or practicing gymnastics. The only difference between Emma Grace and her best friend, Bailey, is that Emma Grace has Down Syndrome. Sarah Pizer, Emma Grace’s mother, says the day Emma Grace was born was a giant blur. “One minute, she was being placed on my chest by the doctor proclaiming, ‘It’s a girl,’ and the next, the nurse was requesting the neonatologist to come assess her,” Pizer says. “I remember, despite the revolving door of medical staff and family, just holding her and looking at her and thinking, ‘This can’t be true. How could we have not known? What will her future look like?’” Despite these initial, and sometimes continuing questions, Emma Grace proves every day that she is strong and courageous. Pizer explains that while Emma Grace may not meet the traditional milestones at the same time her peers do, she will eventually meet them. Emma Grace simply goes at her own pace and brings her loving personality to everyone around her. Early Steps therapy greatly contributed to Emma Grace’s success. At three months old, they began helping her get on a track for success and push her to do more. She began walking by the age of two, scooting around until she was ready. She expresses herself charismatically and interacts effectively with those around her. Nolan also plays a role in helping Emma Grace learn and grow. Pizer says Nolan pushes Emma Grace to keep up with him while playing, so she is encouraged to go above and beyond. “She has the ability to bridge the gap between ‘average’ children and children with disabilities,” Pizer says. “To her family and friends, Emma Grace is a typical three-year-old little girl.” This is especially true between Emma Grace and Bailey, Pizer says. However, many people have misconceptions about Down Syndrome and don’t understand the disorder. Pizer says people with Down Syndrome may have speech, motor, and cognitive delays but can still achieve any goal they put their mind to. Emma Grace also participates in Beyond Gymnastics, a gymnastics program that caters to individuals with disabilities or special needs. “The owners and instructors have created this amazing program for kids with special needs to be able to participate in activities and have the same opportunities as their peers,” Pizer says. 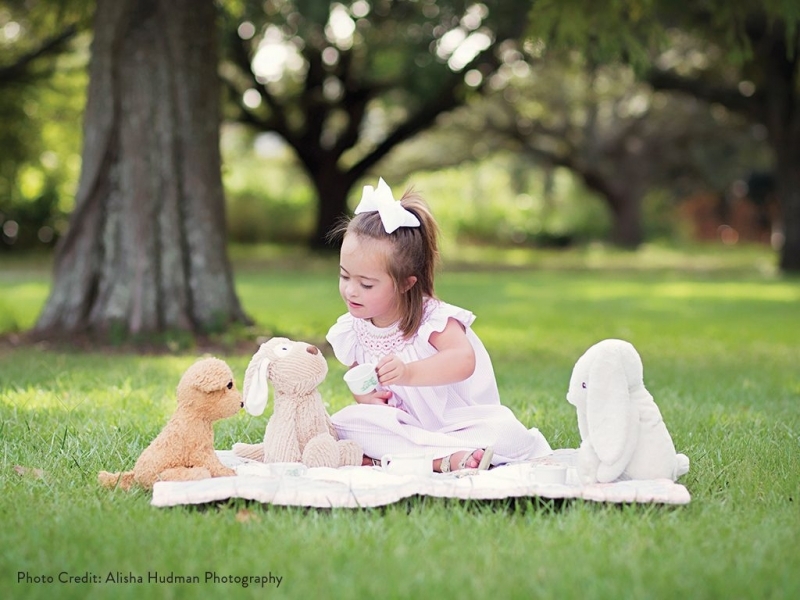 Emma Grace is a beautiful illustration of the compassion and perseverance within the Down Syndrome community, as she never meets a stranger and is always the first person to say hello. The positive attitudes of these parents will enable Emma Grace to truly be whatever she wants to be. Having someone have confidence in you and loving support is everything!